With the birth of email and other virtual storage platforms, sending a fax is almost obsolete now. People don’t see a need of sending fax anymore. However, many people’s work process still involves sending and receiving a fax. Especially when it comes to legal documents, fax remains an integral part of preserving office records. With such software, you can fax from your computer and don't need a traditional fax machine. Hence, no hardware expenses and no large fax machine. 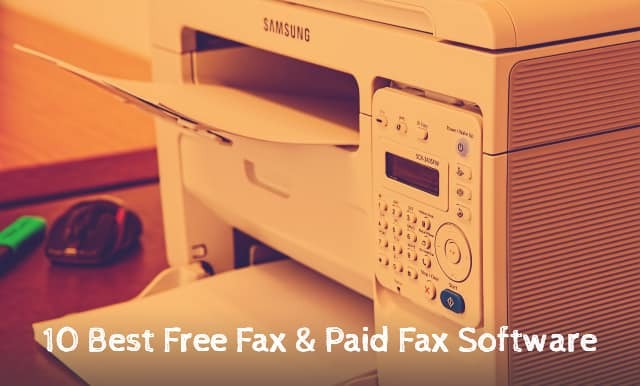 With faxing software, you eliminate the need for a phone line, fax machine, the paper, and the ink required to print faxes. Of course, there are few limitations that this software possesses. Let us have a look on some of a fax software that gives you an option of sending and receiving fax without spending any money. eFax is a digital faxing platform that enables you to send and receive faxes from anywhere. It is one step beyond other software by allowing you to receive faxes by email. You can choose to view or sign the fax online without having to print and scan the document. eFax is a cloud-based secure solution. The only drawback is random eFax number assigned to you which you need to inform your recipient. The eFax plan is 150 incoming and 150 outgoing faxes. After the limit, you are charged as per every page. The features of eFax are noticeably good with the easy and convenient interface. RingCentral is an online fax service that lets you send and receive faxes via the Internet through its service portal. One can send and receive faxes by email, computer or smartphone. The feature that makes it unique is the ability to block any number that sends you spam faxes. Other best thing is the free mobile app that makes faxing easier. The application does not require maintenance and is always up to date. Also, you can fax using any application including Microsoft Outlook, Microsoft Office and online storage services. Nextiva Fax is another faxing software to send faxes. With Nextiva, you can access copies of your sent faxes from your email or online portal. People who plan on sending many faxes, Nextiva Fax, is the best as it offers 500 free faxes per month making it ideal. The cost after exceeding the limit is very low as compared to other software. Nextiva automatically converts received faxes into PDF format. Sfax is secure and private online faxing software to send, receive, annotate and digitally sign documents without having to worry about printing and scanning the document. Sfax stores all documents on cloud-based servers. A free mobile application is available for Android and iOS. The bad side? Sfax limits sending and receiving faxes by offering 100 free pages per month. But it charges only for successfully delivered fax pages. Free Fax Button provides standard features that each service offers. The unique part is that this software is completely free. It offers free online faxing to 50 countries. However, this free fax service is limited to two free faxes per day. The other best part is that there is no registration required to send or receive a text. MetroFax is a good faxing service with standard security features. MetroFax encrypts all of your documents using SSL or TSL encryption. However, if recipient’s mail server cannot accept encrypted transmissions, the files will revert to basic SMTP format. It offers you 500 shared pages per month. Also, a mobile application is available with easy user interface. MyFax has a dedicated faxing service which has a full feature set. It offers you unlimited storage, international faxing, and Microsoft Outlook integration. MyFax also offers various account management capabilities including password protection, auto-resend, toll-free fax numbers and different ways to access support. No matter what is your location, with MyFax you can acquire a local fax number. MyFax allows users to send 100 free faxes per month and receive 200 for free. Catch? With MyFax, you can send faxes to 50 recipients at once. It provides online mail to fax transmissions with features like digital signature, a fax number, email faxing, fax storage and fax logging. TrustFax has a clean interface which helps you to navigate online portal quickly and with ease. The basic plan of TrustFax offers you 300 faxes per month. But it is free only for one month. After one month, you have to pay a minimal amount to send faxes. It does not provide various plans, but it does provide 24/7 customer service. Popfax is a fax to email service which makes it much easier to send and receive a fax. Unlike Free FaX Button which had two faxes limit per day, Popfax has no limit. There is no software installation required. Also, a mobile app is available with straightforward and clean user interface. The mail merging feature of this service allows you to send a fax to multiple people at once and also you can add personal information of each recipient. FaxZero lets you send two free faxes per day supporting multiple formats like images, office files, pdf, text files, etc. Advertising supports the service on the website and on the cover pages of free faxes you send. It is easy and updates you the status of your fax via email. So this was all about some of the best fax software out there. If you're an Android user then you can install fax apps on your Android smartphone too.